For other people named Bartholdi, see Bartholdi (disambiguation). Bartholdi was born in Colmar, France, 2 August 1834. He was born to a family of German Protestant (Alsatian) heritage, with his family name romanticized from Barthold. Jean Charles Bartholdi (1791–1836) and Augusta Charlotte Bartholdi (née Beysser; 1801–1891), Frédéric Auguste Bartholdi was the youngest of their four children, and one of only two to survive infancy, along with the oldest brother, Jean-Charles, who became a lawyer and editor. Bartholdi's father, a property owner and counselor to the prefecture, died when Bartholdi was two years old. Afterwards, Bartholdi moved with his mother and his older brother Jean-Charles to Paris, where another branch of their family resided. With the family often returning to spend long periods of time in Colmar, the family maintained ownership and visited their house in Alsace, which later became the Bartholdi Museum. While in Colmar, Bartholdi took drawing lessons from Martin Rossbach. In Paris, he studied sculpture with Antoine Etex. He also studied architecture under Henri Labrouste and Eugène-Emmanuel Viollet-le-Duc. Bartholdi attended the Lycee Louis-le-Grand in Paris, and received a baccalaureat in 1852. He then went on to study architecture at the École nationale supérieure des Beaux-Arts as well as painting under Ary Scheffer in his studio in the Rue Chaptal, now the Musée de la Vie Romantique. Later, Bartholdi turned his attention to sculpture, which afterward exclusively occupied him. 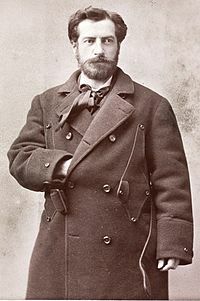 Bartholdi early in his career. In 1853, Bartholdi submitted a Good Samaritan-themed sculptural group to the Paris Salon of 1853. The statue was later recreated in bronze. Within two years of his Salon debut, Bartholdi was commissioned by his hometown of Colmar to sculpt a bronze memorial of Jean Rapp, a Napoleonic General. In 1855 and 1856 Bartholdi traveled in Yemen and Egypt with travel companions such as Jean-Léon Gérôme and other "orientalist" painters. The trip sparked Bartholdi's interest in colossal sculpture. In 1869, Bartholdi returned to Egypt to propose a new lighthouse to be built at the entrance of the Suez Canal, which was newly completed. The lighthouse, which was to be called Egypt Carrying the Light to Asia and shaped as a massive draped figure holding a torch, was not commissioned. Both the khedive and Lessups declined the proposed statue from Bartholdi, citing the expensive cost. The Port Said Lighthouse was built instead, by François Coignet in 1869. Bartholdi sculpting. To the left is a miniature of Liberty Enlightening the World. Bartholdi served in the Franco-Prussian War of 1870 as a squadron leader of the National Guard, and as a liaison officer to Italian General Giuseppe Garibaldi, representing the French government and the Army of the Vosges. As an officer, he took part in the defense of Colmar from Germany. Distraught over his region's defeat, over the following years he constructed a number of monuments celebrating French heroism in the defense against Germany. Among these projects was the Lion of Belfort, which he started working on in 1871, not finishing the massive sandstone statue until 1880. In 1871, he made his first trip to the United States, where he pitched the idea of a massive statue gifted from the French to the Americans in honor of the centennial of American independence. The idea, which had first been broached to him in 1865 by his friend Édouard René de Laboulaye, resulted in the Statue of Liberty in New York harbor. After years of work and fundraising, the statue was inaugurated in 1886. 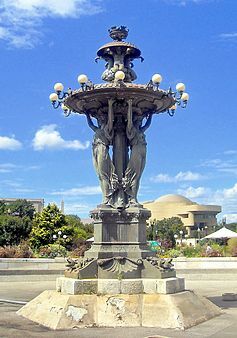 During this period, Bartholdi also sculpted a number of monuments for American cities, such as a cast-iron fountain in Washington, DC completed in 1878. In 1875, he joined the Freemasons Lodge Alsace-Lorraine in Paris. In 1876, Bartholdi was one of the French commissioners in 1876 to the Philadelphia Centennial Exposition. There he exhibited bronze statues of The Young Vine-Grower, Génie Funèbre, Peace and Genius in the Grasp of Misery, receiving a bronze medal for the latter. His 1878 statue Gribeauval became the property of the French state. 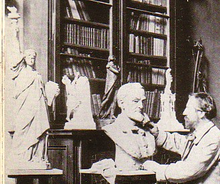 A prolific creator of statues, monuments, and portraits, Bartholdi exhibited at the Paris Salons until the year of his death in 1904. He also remained active with diverse mediums, including oil painting, watercolor, photography, and drawing, and received the rank of Commander of the Legion of Honor in 1886, died of tuberculosis in Paris on 4 October 1904, aged 70. In 1876, he married Jeanne-Emile Baheux in Providence, Rhode Island. Throughout his life Bartholdi maintained his childhood family home in Colmar; in 1922, it was made into the Bartholdi Museum. Bartholdi broached the idea of a massive statue. 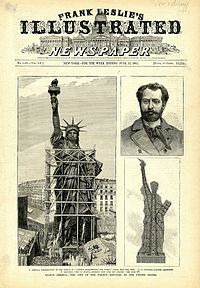 Bartholdi's design approved on, the Union Franco-Americaine raised more than 1 million francs throughout France for the building of the statue. In 1879, Bartholdi was awarded design patent U.S. Patent D11,023 for the Statue of Liberty. [clarification needed] On 4 July 1880, the statue was formally delivered to the American minister in Paris, the event being celebrated by a great banquet. In October 1886, the structure was officially presented as the joint gift of the French and American people, and installed on Bedloe's Island in New York Harbor . 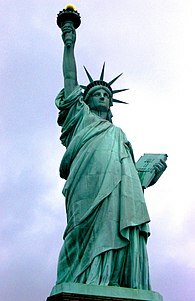 It was rumored in France that the face of the Statue of Liberty was modeled after Bartholdi's mother. The statue is 151 feet and 1 inch high, and the top of the torch is at an elevation of 305 feet 1 inch from mean low-water mark. It was the largest work of its kind that had ever been completed up to that time. Bartholdi's hometown Colmar (modern political administrative region of Alsace-Champagne-Ardenne-Lorraine) has a number of statues and monuments by the sculptor, as well as a museum founded in 1922 in the house in which he was born, at 30 Rue des Marchands. 1876 (plaster version in 1874) : Frieze and four angelic trumpeters on the tower of Brattle Square Church, Boston, Massachusetts, United States. 1876: Lafayette Arriving in America (executed 1872, cast 1873) in Union Square, New York City, United States. 1878: The Bartholdi Fountain in Bartholdi Park, the United States Botanic Garden, Washington, D.C., United States. 1880: The Lion of Belfort, in Belfort, France, a massive sculpture of a lion depicting the huge struggle of the French to hold off the Prussian assault at the end of the Franco-Prussian War. A plaster was exhibited in 1878. Bartholdi was an officer himself during this period, attached to Garibaldi. 1889: Switzerland Succoring Strasbourg at Basel, Switzerland, which was a gift from the French city of Strasbourg, in appreciation of the humanitarian help it had received during the Franco-Prussian War. 1890: Statue of Liberty in Potosí, Bolivia. 1892: Fontaine Bartholdi, on the Place des Terreaux, in Lyon, France. 1895: Lafayette and Washington Monument," in the Place des États-Unis, Paris, and an exact replica at Morningside Park, New York City, United States. 1903: Vercingetorix, equestrian statue of in Place de Jaude, Clermont-Ferrand. Vercingetorix, Place de Jaude, Clermont-Ferrand. Wilson, J. G.; Fiske, J., eds. (1900). "Bartholdi, Frederic Auguste" . Appletons' Cyclopædia of American Biography. New York: D. Appleton. ^ a b c d e f g h i j k l m n o p q "Bartholdi, Frédéric-Auguste". www.nga.gov. National Gallery of Art. Retrieved 5 August 2016. ^ Moreno, Barry (10 November 2004). The Statue of Liberty. Arcadia Publishing. ISBN 9781439632208. Belot, Robert; Daniel Bermond (2004). Bartholdi. Durante, Dianne (2007). Outdoor Monuments of Manhattan: A Historical Guide. New York University Press. Gschaedler, Andre (1966). True Light on the Statue of Liberty and Her Creator. Moreno, Barry (2000). The Statue of Liberty Encyclopedia. New York: Simon & Schuster. ISBN 0-684-86227-1. 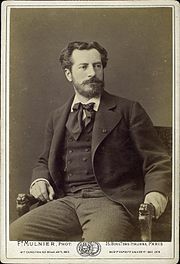 Wikimedia Commons has media related to Frédéric Auguste Bartholdi.